Linda Bassick's weekly Friday Morning Sing-Along at Burlington's Radio Bean attracts legions of local kids — and their parents — with the singsong strains of children's music classics such as "Puff the Magic Dragon," "The Green Grass Grew All Around" and "Move Over for Marty." Each of these beloved tunes and many more can be found on Bassick's recently released 13-song album, Friday Morning Sing-Along, most of which was recorded live at a Sing-Along last year. Bassick is best known to grown-ups as a member of the local bands Mellow Yellow and Steady Betty, and for her folksy solo pursuits. She's an accomplished singer and guitarist and applies veteran chops to each song on the record, which are matched only by her veteran chops as a mom — the record is dedicated to her son, Leo. Bassick knows how to appeal to kids as well as how not to drive parents crazy, which is always a fine balance to strike in children's music. There is a whimsical looseness to tunes such as "Oh Susannah," "Fishing Blues" and "Rocking Robin," often bolstered by the pleasant sounds of singing children in the background. The kids' bright chirping adds energy to the live recording, especially when Bassick interacts with her tenderfoot audience. The best example comes on "Take Me Riding," on which the singer adapts each verse to what the kids want to ride next — a tractor, a train, a wagon, etc. Bassick gears her music toward young ears, but she doesn't pander. Musicality abounds. Bassick is a sturdy guitarist and versatile vocalist. Here she sings in a plain, unadorned alto that's easy to sing along with but still works on more mature and discerning ears. Fiddler Erin Mackle drops in on a few numbers, as well, adding welcome diversity to the album's primarily guitar-and-vocals aesthetic. Mackle also provides winsome harmonies and call-and-response vocals — "Green Grass" is a particularly fun example. Though the majority of the album was recorded live, it closes on four tunes that were tracked at the Tank Studio in Burlington and at Egan Media Productions in Colchester. They lack the immediacy of the live tracks but showcase Bassick's musical polish. Her "Twinkle Twinkle/ABC/Baa Baa (Medley)" is clever and light, and her version of "Puff" is a keeper. So are renditions of "The Lion Sleeps Tonight" and "How Sweet It Is," suggesting a full studio album might be a wise follow-up. Whether live or in studio, Bassick's combination of musical chops and nurturing know-how make Friday Morning Sing-Along fun for kiddos and tolerable for parents, who undoubtedly would have to spin it on repeat. Friday Morning Sing-Along with Linda Bassick & Friends happens every Friday at 11 a.m. at Radio Bean in Burlington. 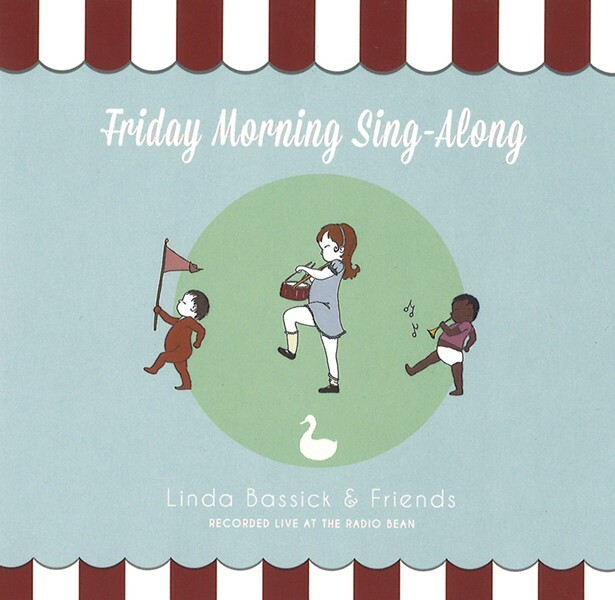 Friday Morning Sing-Along by Linda Bassick & Friends is available at cdbaby.com/cd/lindabassick2.